HomeBlogUncategorizedWhy is the AC in My Car Not Working? Why is the AC in My Car Not Working? Air conditioning plays a vital role in our day to day comfort. With cool, refreshing air available at the turn of a knob, it’s no wonder we so often take this comfort for granted. That’s especially true in our vehicles, where functioning AC plays an even more essential role in our safety. What happens when that air conditioning breaks down, and how can we (as drivers) figure out what the problem likely is? We’ll be diving into the topic of car air conditioning service and repair today. By the end, you should have a basic idea of how to match symptom to related part failure, and you’ll definitely know when to schedule car AC repair! Let’s get started. “Why did my car AC stop blowing cold air? !” That’s a question our mechanics here all the time at Express Auto Repair & Emissions. Like certain engine power problems, AC malfunctions can be traced to a variety of potential part failures. That means that answering our question actually requires a little bit of digging. Below, are a few familiar situations that will help us outline possible explanations. Of course, you could just bring your car straight to the auto maintenance shop, but where’s the fun in that? Did you know that the air conditioning system operating in your vehicle is actually fairly similar to the one cooling your home? This system relies on a variety of moving parts, but it can only function with sufficient refrigerant. 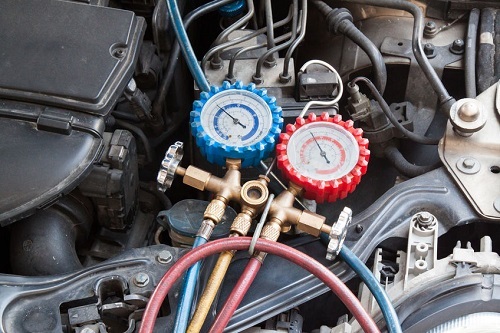 Modern vehicles rely on R-134a, a more environmentally friendly replacement for Freon. Think of it as the blood that allows your AC to thrive, only this cold fluid frequently alternates between liquid and gas states. One of the common reasons why vehicles lose cooling capabilities is a shortage of refrigerant (many still call it “Freon”). Because the fluid won’t simply run out by itself, there’s usually a leaky part behind the problem. Most mechanics will point towards the compressor as the likely suspect, especially if the hot air is accompanied by loud clanging or squealing sounds. Another potential cause could be the evaporator, where the refrigerant should cool the air blown by your fan. Just before the evaporator is the expansion valve, which moderates the intake of refrigerant. A faulty valve may check the fluid supply so that too little reaches the evaporator. Why Did My Car AC Stop Blowing Air? An even more serious problem is a complete lack of air coming out of the vents. This could indicate a multiple part failures or a single malfunction that triggered a shutdown. Again, with so many possible explanations, it often takes a professional to discern the true cause of the air conditioner failure. Below, we’ll highlight our most common reasons for the AC to stop working. As you can imagine, different parts come with varying prices and labor requirements. 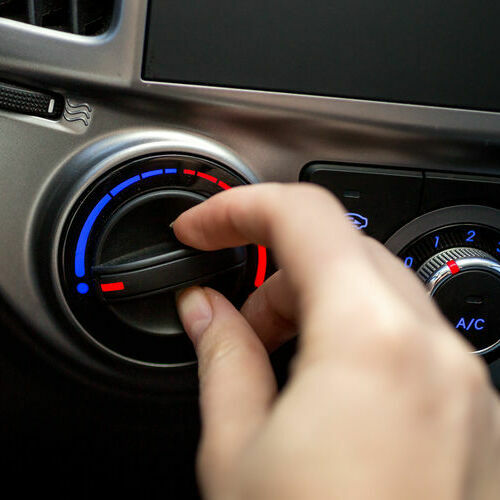 While you could attempt to replace a few minor parts yourself, many parts of the air conditioning system should only be handled by a professional (especially refrigerant and electrical parts). After all, you wouldn’t want to add a hospital visit to your car AC repair cost! Let’s get to the big question: How much does it cost to get air conditioning fixed in a car? If you are having a noticeable drop in cooling capabilities, you’ll likely need to arrange a checkup and refrigerant recharge. That typically begins in the $100 to $300 range, though a related part replacement (likely in the event of leak) could push your costs into the upper hundreds. Say your mechanic diagnoses a complete compressor failure under the hood. A part replacement of this size will launch your total into the thousands. At this point, only the most devoted car owners consider car AC repair. Most tend to start shopping for a replacement vehicle. Call Our Car AC Repair Shop! It can be very challenging to keep your cool when the air conditioning has gone out. After all, AC plays an essential role in our daily lives. When that day comes, it pays to have your Schaumburg, IL car service ready to go in your phone’s contact list! Contact our trusted mechanic as soon as possible to prevent additional damage to other system parts. Ready to get the ball rolling on your relief? Our team at Express Auto Repair & Emissions would be thrilled to help! Contact our Schaumburg, IL car AC repair shop and tell us about your problem. We’ll be happy to arrange an appointment that fits with your busy schedule. To begin, simply our friendly staff at 847-895-9131. Posted in Uncategorized and tagged car ac repair, heating and cooling, refrigerant recharge on April 9, 2019 by Express Auto. ← Why Change Fluids in Your Car?